Happy Monday. Like my amateur Photoshop? No? Well, then, how about a little music…. (You can put your middle fingers down now). The EEOC wants more data on 63 million employees. 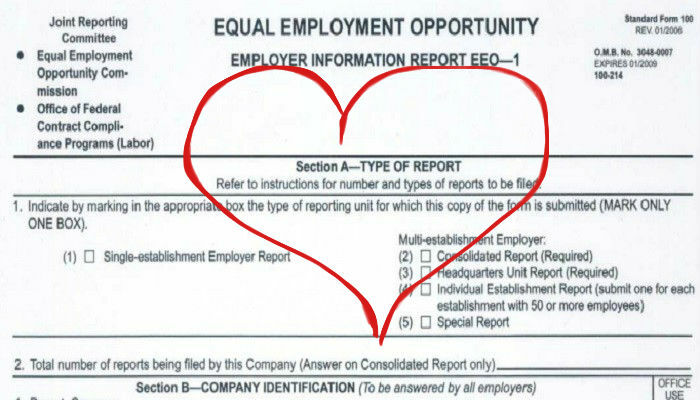 What is the EEO-1? And who needs to file it? The EEO-1 Report is a compliance survey, in which qualifying companies report employment data categorized by race/ethnicity, gender and job category. With limited exception, all private employers, including federal contractors, with 100 or more employees must file an EEO-1. Ok, so what’s changing? And when? Later today, according to an EEOC press release, the proposed changes will be available for inspection and public comment on the Federal Register website. Or, you can look at my advance copy here. The long and short of it is this: Starting in 2017, filers with 100 or more employees will need to provide data on employees’ W-2 earnings and hours worked*, which EEO-1 filers already maintain in the ordinary course of business. Here is the new proposed EEO-1 form. *The EEOC is not proposing to require an employer to begin collecting additional data on actual hours worked for salaried workers, to the extent that the employer does not currently maintain such information. Employers are encouraged to comment on this issue. Why does the EEOC need this extra pay information? (Consider this your first warning). The EEOC plans to use this pay data “to assess complaints of discrimination, focus agency investigations, and identify existing pay disparities that may warrant further examination.” Additionally, EEOC Chair Jenny R. Yang suggests that this new reporting requirement will “assist employers in evaluating their pay practices to prevent pay discrimination and strengthen enforcement of our federal anti-discrimination laws.” Maybe. Or, maybe, the raw data will not reflect legitimate, non-discriminatory differences in pay (e.g., experience, skill, etc.). Business haven’t exactly lined up in support of this proposal. Still, if your compensation data does suggest pay disparities among the same classification of employees, it’s worth digging deeper to determine the reason for yourself.